We have just finished watching the official keynote of the new iPhone launch event (taking place in the US) and it is time to get down to business. Most of the rumours surrounding the new iPhone have proven to be true, the biggest one being that the company has launched two new iPhone models instead of a single one, which had been the norm for Apple since first launching the iPhone back in 2007. Christened iPhone 5s and iPhone 5c, the new devices have been launched for the dual purpose of replacing the iPhone 5 (iPhone 5s), as well as targeting a new mid-price range segment of the smartphone market (iPhone 5c). However, unlike popular belief, the company did not increase the display screen size and has gone with the same 4 inch size for both the new models. Another thing that the company has not done is introduce a 128GB version, an unreasonable expectation to begin with. Here is a look at the specifications of the new iPhones. The device sports a 4 inch widescreen multi-touch retina display (1136Ã—640 pixel resolution) with 326 ppi pixel density. It is powered by the next-generation A7 chip with 64-bit architecture (which the company claims is up to 2x faster than the A6 chip) and a M7 motion coprocessor. The new M7 coprocessor is like a sidekick to the A7 chip, and is designed specifically to measure motion data from the accelerometer, gyroscope, and compass- a task that would normally fall to the A7 chip. As far as internal memory goes, Apple has stuck to the same 16, 32 and 64 GB combination. The smartphone features an 8 megapixel (with 1.5µ pixels) autofocus rear camera with True Tone Flash. The camera comes with five-element lens, a hybrid IR filter, backside illumination sensor and a sapphire crystal lens cover. It also has a 15 percent larger sensor, bigger pixels (measuring 1.5 microns) and an aperture of Æ’/2.2, all of which let in more light- for better pictures. Burst mode lets you capture multiple shots by snapping 10 photos per second, while a white LED and an amber LED work with software algorithms to adjust the flash intensity and colour temperature, to light the subject perfectly. It can also record full high definition videos (1080p) at 30 frames per second and comes with improved video stabilisation and Slo-mo video (shoot video at 120 frames per second at 720p and play back any section at quarter speed for a slow motion effect). You can take snapshots while video-recording and also capture panoramic pictures. The front-facing camera is still 1.2 MP and can record HD videos (720p). Live video zoom enables users to zoom in up to 3x on whatever you are recording, while you are recording it (already offered by a number of third party apps). As for connectivity, the device has Bluetooth 4.0, Wi-Fi, 3G and 4G LTE. It measures 123.8mm x 58.6mm x 7.6mm and weighs 112 gm. According to Apple, the battery will provide up to 10 hours of talk time on 3G, 10 hours of video and Wi-Fi browsing, 40 hours of music and over 10 days of standby time. The device supports a Nano-SIM and hence will not be compatible with existing micro-SIM cards. Apart from the usual silver and space grey colours, Apple has also added a gold version of the iPhone. A new feature addition in the form of 'Fingerprint identity sensor' has also been done by Apple. The sensor has been built into the Home button and enables users to unlock the device via fingerprint recognition. Users can also store multiple fingerprints. While this ones an interesting feature, how effective it is against oily or dirty fingers, etc. is something we will get to know only after its use in the real world. If you want to compare the device with the iPhone 5, you can read about that in detail here. Taking a cue from Nokia's Lumia devices and the recently unveiled Moto X from Google, Apple has launched this one in a number of candy bar colours that include red, white, yellow, blue and green. This one also has a 4 inch widescreen multi-touch retina display (1136Ã—640 pixel resolution) with 326 ppi pixel density. It is powered by the A6 chip and in terms of internal memory, users will only have a choice between 16 and 32GB versions (no 64GB). The smartphone features an 8 megapixel autofocus rear camera with LED Flash. The camera comes with five-element lens, f/2.4 aperture, a hybrid IR filter, and a backside illumination sensor. It can also record full high definition videos (1080p) at 30 frames per second (with video stabilisation). The front-facing camera is 1.2 MP and can record HD videos (720p). As for connectivity, the device has Bluetooth 4.0, Wi-Fi, 3G and 4G LTE. It measures 124.4mm x 59.2mm x 8.97mm and weighs 132 gm, making it thicker and heavier than the iPhone 5s. According to Apple, the battery will provide similar talk time, video playback and stand by time as iPhone 5s. This one also only supports a Nano-SIM. At an over Rs 35,000 price, the iPhone has failed miserably to live up to the expectations of being the first affordable iPhone for the masses. It will go up for pre-order in the US from September 13. 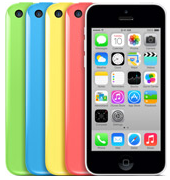 The company has kept the prices of the device in the standard range, since it replaces the existing iPhone 5. The smartphone goes up for pre-order in the US from September 20. Note that all the above mentioned prices are not the final rates of the devices in India. The actual price should in fact be a little higher after the import duties and taxes applicable in the country. Also, while the company has not mentioned an Indian launch date, we think the smartphones should hit the local smartphone market by December 2013 (probably even faster unofficially). While the company did not provide wireless charging with the new iPhones, it did try and compensate for the same by introducing tailor-made cases for both the models. The iPhone 5c cases come in six hues (black, white, pink, yellow, blue and green) with a design that allows the colour underneath to show through, creating 30 colour combinations possible. In comparison, the iPhone 5s case also comes in six different colours (brown, beige, black, yellow, blue and red) and is deliberately shaped to cover the volume buttons, the on/off switch, and the edge of iPhone 5s. Inside, a soft micro fiber lining protects the exterior of the iPhone. Note that while the iPhone 5c case is made of silicone, the iPhone 5s case is made of leather. While the iPhone 5c case is available for $29 (Rs 1,851), the iPhone 5s case is priced slightly higher at $39 (Rs 2,489). It's almost as if Apple has entered into a habit of disappointing its loyal customers in the post-Jobs era. The company disappointed with the iPhone 5, disappointed again with the new MacBook's, and has now disappointed with the new iPhones. Although don't be surprised if Apple comes back with awesome pre-booking numbers like '10 million devices sold in the first week,' this will be because even though the devices are nothing to write home about, they are unfortunately still one of the best ones out there, at least for now (Google take cue). Note we are not saying that the new iPhones are crappy devices, but we expected more from Apple (a lot more!). In fact, Google did a much better job with Motorola Mobility, the company it had acquired for $12.5 billion in May 2012. The company had bet on customisation with its flagship smartphone Moto X, instead of all-out war with Apple and Samsung, a move we feel worked in favour of the company (read more about that here).